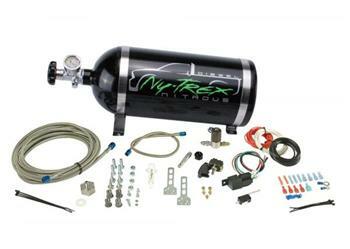 Ny-Trex Nitrous System - Diesel UNIVERSAL - Dezod Motorsports Inc - Home of the automotive performance enthusiast since 2002. Ny-Trex is proud to introduce the next phase of nitrous innovation for the ever popular diesel market. The Big-Diesel Dry Nitrous System allows you to turn that “Black Smoke” from performance tunes into horsepower and torque. Ny-Trex nitrous systems use only the highest quality materials and components and have been thoroughly dyno-tested on numerous vehicles to ensure the most safe and reliable performance for your diesel. Dry nozzles are precision machined from 6061 billet and feature unique 110˚swirl cone pattern. Big-Dry nozzle is 1/8” npt for diesel and big HP.